6 Spooky Facts About The Haunted Serpent with Author Dora M. Mitchell | YAYOMG! If you’re a fan of spine-tingling stories with side-splitting humor, look no further! 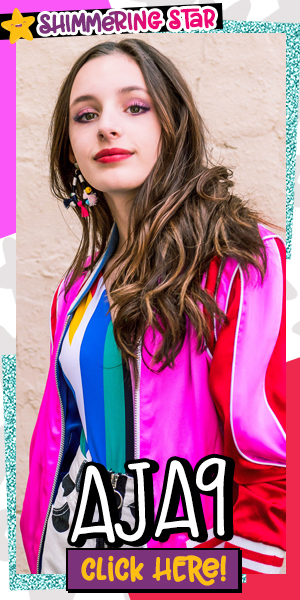 We’ve got the perfect pick for you. 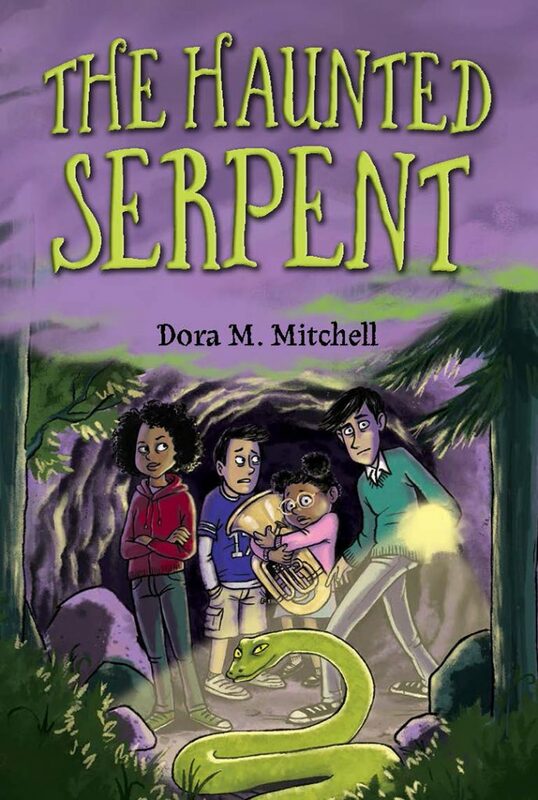 The Haunted Serpent by Dora M. Mitchell hit bookstores this week from Sterling Kids, and it’s such a fun adventure that’ll have you page turning all night long. From zombies to ghosts to serpents and side-splitting humor, it’s got everything you could ever need in a creepy tale. Spaulding Meriwether is doing his best to fit in at his new school, he even gave himself a shiny new nickname, but things just aren’t working out the way he hoped. To make matters worse, he’s discovered that there are some super eerie, possibly paranormal things happening in his new town of Thedgeroot and decides to investigate. 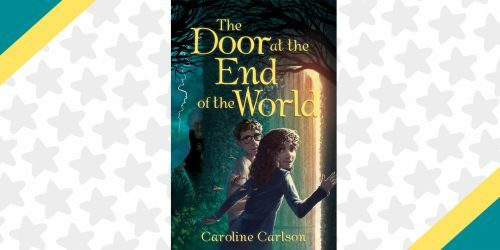 We love how the author weaves in paranormal thrills with the struggle of trying to fit in at a new school – as if that wasn’t scary enough! Paired with illustrations from Spaulding’s notebook that give life to the happenings of the book, we think readers will think The Haunted Serpent is a story to DIE for! Then he notices the chimneys of the abandoned factory at the edge of town puffing smoke—and his dead next-door neighbor materializes, along with David, the missing pet boa constrictor that supposedly ate him. Spaulding can’t help wondering if these strange happenings have anything to do with his undead friends in the forest. Of course, Spaulding just has to investigate—but he may be biting off more than he can chew. This book SO much fun and is such a great balance of spooks and laughs. We think it’s an excellent choice for any reader and makes for a great casual, yet intriguing pick for Summer reading! Ready to take a deeper look at the story? Keep on reading below as author Dora M. Mitchell shares 6 spooky facts about The Haunted Serpent! I “met” my main character, Spaulding Meriwether, way before I knew anything about the story he would eventually inhabit. 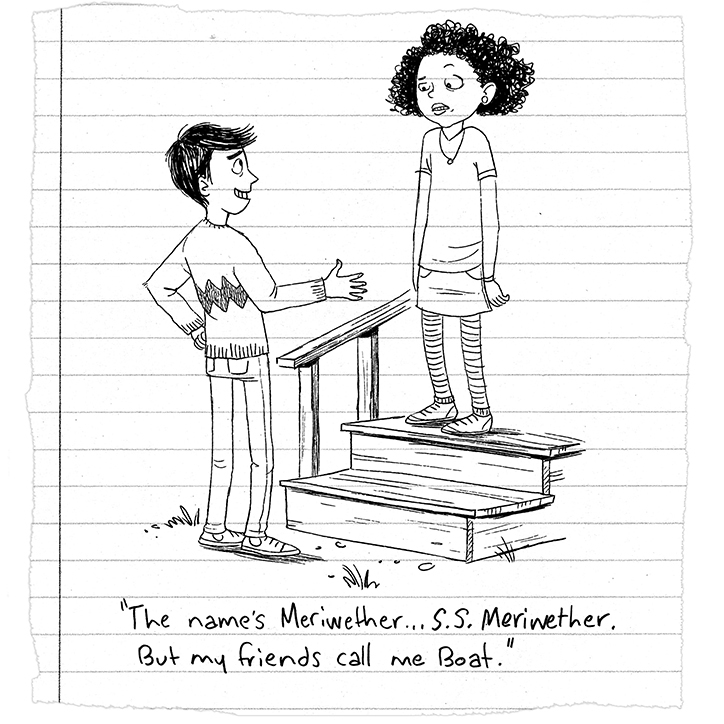 He popped into my head one day out of the blue, introducing himself in his favorite way: “The name’s Meriwether—S.S. Meriwether. But my friends call me Boat.” As soon as I heard him say that, I also knew Spaulding didn’t actually have any friends yet—and definitely none that called him Boat! When I was a kid, my parents told me about a guy they knew who’d decided to cover his jacket with buttons because he wanted people to nickname him “Buttons.” Little-kid-me thought that was hilarious—and also really interesting. What kind of person would try that hard to earn a nickname? Isn’t a nickname supposed to be given to you by others to show they know and accept you? Or is it just as good—maybe better—to take that power back for yourself and decide what you’re going to be called? All I know for sure is that 20-some years after hearing about Buttons, along came Spaulding, calling himself Boat! I guess I never stopped thinking self-nicknaming says a lot about a person. Speaking of names, one of my favorite characters in the story is the snake the book is named after. He’s a pet boa constrictor named David Boa—but he came very close to being named Boa Fett! (Only Star Wars geeks are going to get that one.) But David Bowie is my all-time greatest hero and creative inspiration, so in the end, I went with the tribute to him, rather than the tribute to my all-time favorite movies. I always do things the hard way. Once I’d met Spaulding, I sat down and started writing without any idea what I was going to write, other than a spooky mystery. I was too excited to see what Spaulding was going to do—I couldn’t stop to plan! But since I didn’t know what I was writing, the story ended up going through sooo many drafts. SO. MANY. I mean, there were versions with monsters, and folklore creatures, and something called sandwich cozies(?! ), and someone named Cousin Alice. Who was Cousin Alice?! I don’t even know anymore! I really wrote this story the hard way. The good thing about doing things the hard way is LEARNING! I learned so much from all those abandoned subplots. I also learned that I didn’t want to write that way anymore. Now I don’t let myself start writing a new story until I have a solid outline. It saves time, and it keeps me excited about the idea, so I don’t run out of steam too fast when I actually start putting words on paper. If you’ve ever tried writing stories but find that you get bored or stuck before the end, you might want to try this trick too! The Haunted Serpent is illustrated with snippets from Spaulding’s notebook—drawings, newspaper clippings, maps, and more—but it didn’t start out that way! 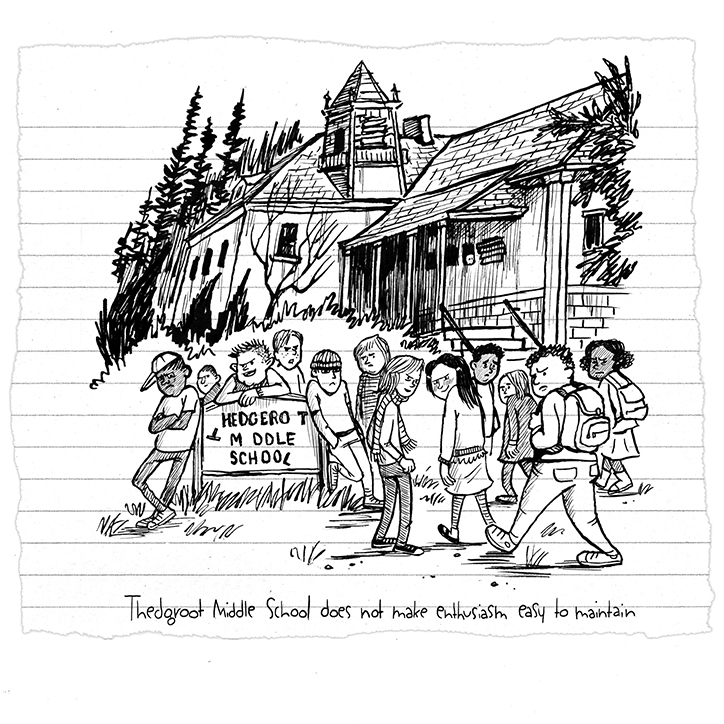 In fact, I considered the story totally finished (somewhere around Version One Million), when an early reader said, “I wish we got to see Spaulding’s notebook.” I’d always wanted to see his notebook myself, but I thought an illustrated book might be harder to get published. But after that reader’s comment, I decided I didn’t care if it was more publishable or not—I just had to illustrate it. So I dismantled the story for the millionth-plus-one time, finding moments I could make into an entry in Spaulding’s notes. 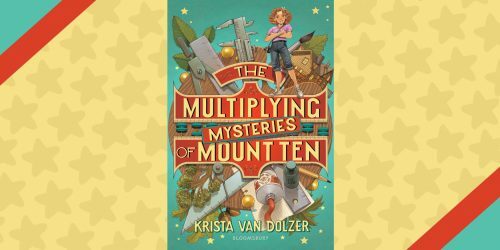 I hope readers will have as much fun uncovering the mysteries of the weird little town of Thedgeroot as I had plotting them…even if I did do it all the hard way! Ready to get spooked? The Haunted Serpent is now available from your favorite place to get books! Thanks so much to Dora for sharing these facts with us and taking our readers beyond the pages of your story. Looking for even more great reads to add to your shelf? 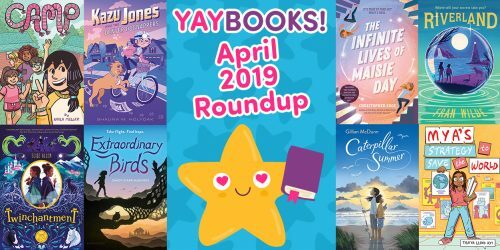 Here’s our roundup of all the books and graphic novels releasing in June!